You have learned how to construct your very first Cacidi Extreme “Item design”. Though this was a very simple, and not completely finished design setup, you got familiar with the main principles of automating with the production method we call “Step’n Repeat”, meaning that business cards were continously created till no more data was available in the content file. It’s now time to work with design variations on a single page, and for that you are going to work with Cacidi Extreme “Page Designs”. Make sure you have opened up the InDesign template named “BusinessCards.indd” (if you happened to save any objects with the file in the previous lesson, you should delete everything from the layout, so you see only the document grid of 8 tiles). 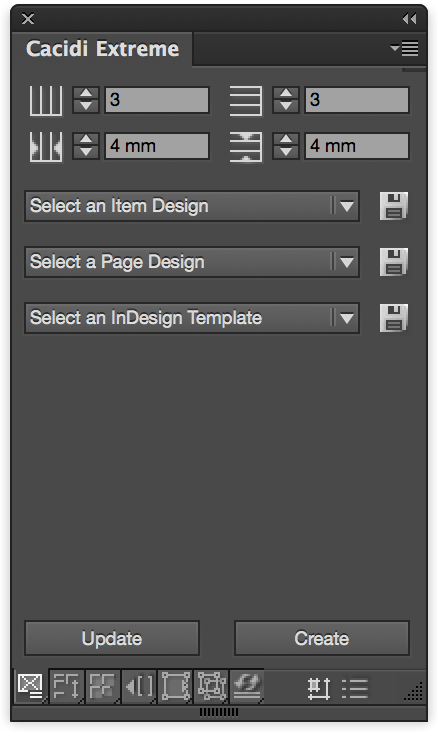 From the “Select a Page Design” pop-up menu in the “Basic panel”, select “New Page Design”. You now see 8 green boxes placed in the layout. These are unassigned boxes ready for Item designs to be assigned. Note, all the boxes are numbered 1 through 8 for your convenience when assigning Item Designs. Tip! Pressing the “Alt” key while selecting “New Page Design” arranges the green boxes horizontally numbered instead of vertical. Highlight the first two boxes in the left column, and then select “MyBizzCardItem” from the “Select an Item Design” pop-up menu. The color of these two boxes now changes to blue. Next, select the lower two green boxes and assign the “BizzAdobe” item design, and finally select the four green boxes in the right column, and assign the “BizzCacidi” item design to these. All eight boxes are now blue, with various item designs assigned. 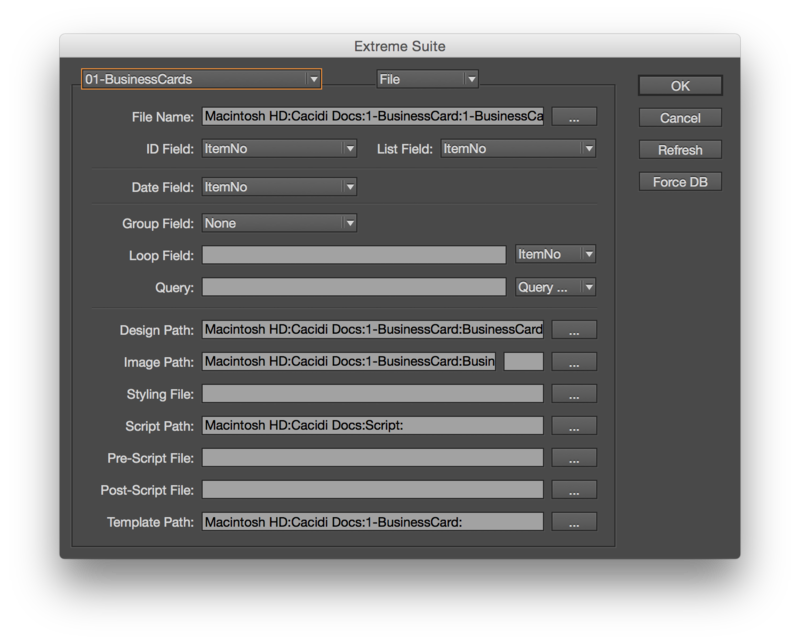 Use the “Save” button, next to the “Select a Page Design” menu in the “Cacidi Extreme” palette to save the page design in your projects folder called “BusinessCards”. Name the page design “MyBizzPageDesign”. “MyBizzPageDesign” from the “Select a Page Design” pop-up menu in the “Cacidi Extreme” palette. Now you see all the blue boxes appear in a new InDesign document, that opens up automatically. Now click the create button and watch your first Step’n Repeat production. Again, in a few seconds you see an automated document page is created, but this time with variation in design throughout the page. The reason for this is that you this time use a Cacidi Extreme “Page Design”, set up as pre-defined design by a compilation of different item designs. Congratulations! You have now completed the first two lessons for the production methods: “Step’n Repeat” and “Pre-defined grid based Design”.